Manual Handling of Carpet rolls poses many Health and Safety problems. 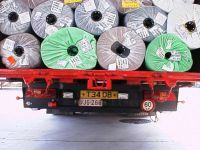 Large carpet rolls are too heavy to lift manually and are often difficult to remove from the trailer due to friction between the rolls. Also for full trailers the driver must climb up the carpet load giving a high risk of injury from falling. The Palfinger Crayler F3 series offers the perfect solution for carpet distribution. The F3 is fitted with a carpet pole that fits inside the carpet roll. Each carpet can be carefully lifted from the lorry without the danger of personal injury or damage to the carpet. The F3 can also be fitted with a combination of carpet pole and forks if the load is a split of carpet rolls and palletised floor tiles. The Palfinger F3 is dismounted from the trailer in less than a minute. 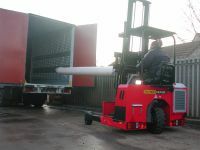 The special mounting system allows the carpet pole to remain on the F3 during transport. 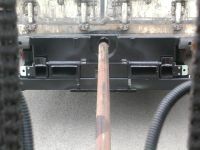 For mounting the carpet pole is simply inserted into a shaft on the back of the trailer then the F3 is mounted in the normal way. The Palfinger F3 really is the perfect carpet handling solution.